It’s one thing to get motivated occasionally, but quite another to STAY motivated! 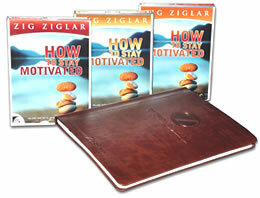 How to Stay Motivated is Zig Ziglar’s flagship program, and one of the best total motivational programs you can buy! Great for people of all ages! This is really THREE incredible audio programs in one, focusing on: Success, Attitude, and Goals. A complete package for anyone who wants the most out of life. Zig Ziglar reveals the secrets to cultivating and maintaining a powerful drive in yourself so you can create the brightest possible future, overcome adversity, push yourself beyond your comfort zone, become a living magnet, become more creative, inspired, and full of hope. I am interested in the Performance Planner – can you advise what the cost would be (cost + shipping) to be shipped to London, UK.